Unlike other popular costumes such as pirates and Star Wars characters, zombies don’t need a "movie year" to be a top costume choice at Halloween. 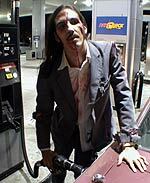 Granted, Land of the Dead breathed new life into an otherwise stagnating costume (and movie) genre, but not a year goes by that zombies don’t end up being one of the most popular costumes. Zombie cheerleaders, zombie hillbillies, zombie housewives, zombie doctors, Starbucks zombies; the list goes on forever, and for good reason. Zombieism isn’t discriminatory. When the Zompocalypse comes, zombies will be created that were ready for cheerleading practice, attending a business meeting, and especially while working in a medical facility of any kind. It’s what makes the idea of zombies so terrifying and also great fodder for scary Halloween costumes. No matter who you are, you’re at risk and will probably become one of the undead eventually. 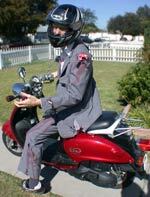 Plus, zombies frequently travel in packs so this makes a popular group costume for men or women. So the first step is to rip up your outfit. Put your entire outfit on as you will wear it (i.e.- if you have multiple layers, don’t wear/rip them separately). 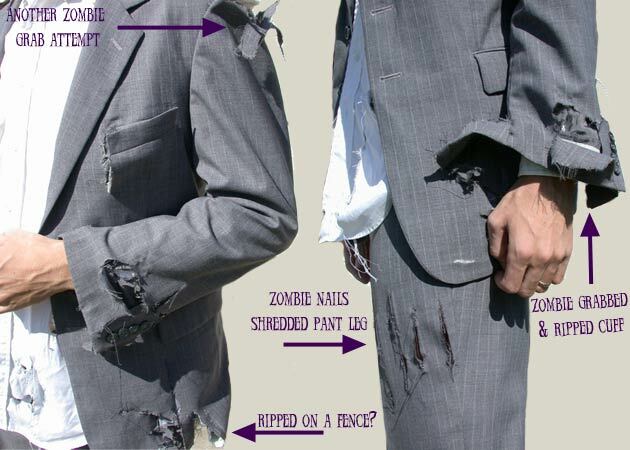 Think of how you might have become a zombie to decide where/how to distress your clothing. Come up with a whole storyline to really sell your costume. 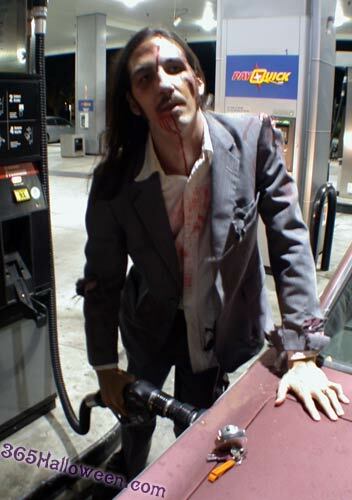 As you can see, zombies got a hold of Sean’s left suit sleeve at the wrist and shoulder. They managed to rip it pretty well, but at one point he escaped with just flesh wounds. A zombie with nails tore into his left pant leg and left a nasty looking set of rips in the pants and his flesh. It’s not shown, but his pocket was also momentarily grabbed and torn off a bit. (Let that be another lesson: always wear tight fitting clothing in case of zombies!) Perhaps you fell off a motorcycle trying to escape and ground huge holes in your jeans and jacket. Or maybe you were wearing a fancy dress that zombies easily grabbed hold of and ripped to shreds. It’s your story so make it a good one. 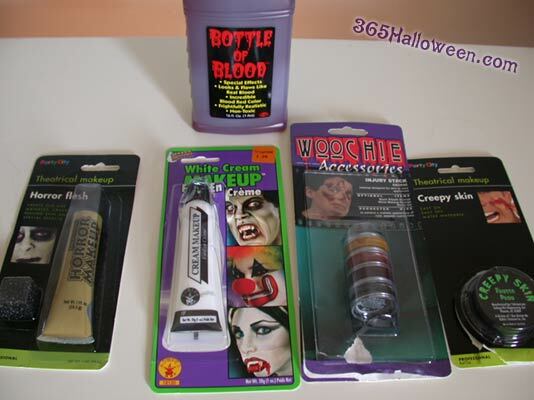 Some of the grabs may have resulted in wounds so next you add fake blood to most areas of distress on your outfit. Leave a few unbloodied, as zombies just aren’t that accurate and probably won’t manage to draw blood with every attempt. Most fake blood dries a pinkish color that is really sad. Add multiple coats of "blood" to darken the stains, letting each application dry first. Or look online for ways to create your own blood. Some words of caution though… corn syrup is very sticky and you don’t want to mess with that on your clothing if you can help it. Next comes the makeup. This can be the most difficult portion if you want realism, so prepare to experiment. This was our first real attempt at creating wounds with makeup, but it actually came out looking alright. We looked online for lots of source images (everyone seemed to do their makeup differently) and chose the best aspects to reproduce. Zombie makeup application is a big old subject unto itself so we will just provide an overview of how we did Sean’s makeup, rather than going in detail. 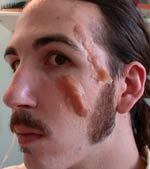 Detailed zombie makeup tutorials can be found here and rad prosthetics can be found here. First we applied a thin layer of white cream face paint to give him a corpse-like pallor. Next we applied the Creepy Skin, which is a lump of fake skin that looks, feels, and acts like a mixture of wax, grease, and hair. Very yucky stuff, and it melted off Sean’s face a few hours into the evening. There’s got to be a better product. (AUGUST 07 UPDATE: Here’s a great tutorial for a realistic wound!) Anyway, we put two strips of this on the left side of his face, leaving the top one flapping a bit at the end to mimic a flap of skin. These are going to make deep, swollen gashes with the addition of makeup. Next we used the injury stack to add bruises, gashes, scraped patches, and under eye circles. Sean had a fresh bruise from a hockey game so we mimicked the color pattern. Yellow and greens around the outer edges, purple closer in, and reds in the center. Yum! Top all that off with a very light layer of baby powder (or plain old cornstarch) to absorb facial oil throughout the night and prevent your oil based makeup from running. 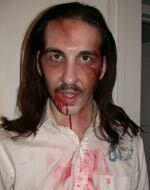 Then we added some fake blood around his mouth and allowed to drip down his neck. Don’t touch this while it’s drying, and it will stay put all night. As an afterthought (we didn’t get a picture of this) we also put a drip of blood coming from his scalp and a couple inches on his forehead. (A zombie clocked him one right in his juicy brain!) A few dabs from the injury stack onto the hands/knuckles (or any other exposed areas you may have due to your selection of clothing) and you’re all set! Body parts (like intestines) make great accessories, but keep in mind you’ll be lugging them around all night. Your storyline should include deciding which injuries you may have sustained that could affect how you walk. Unless you broke your ankle you shouldn’t be using the stereotypical zombie limp. Maybe your neck was chomped to hell and now your head is perpetually slumped to one side. Perhaps your shoulder was dislocated trying to escape the clammy grasp of the undead and now your arm hangs limply at your side. Fill in all the details! Decide on a gait, a speech pattern, and some clever one-liners. Will you just be moaning all evening, or will you have a monotone mummy-like way of saying everything in broken English? Practice by hopping on your scooter (or just take a walk) and going to the store. Ask them which isle the brains are on. Haw. Happy Halloween, zombies! create your own Zombie Costume. Subscribe to comments with RSS or TrackBack to 'Zombie Costume'. My daughter has an old Little Bo Peep costume so we are turning it into Zombie Bo Peep! Awesome…except this year I’m going as a zombie pirate. That should be interesting. I am an amputee too and decided to go as a zombie and chew my fake foot off. I have a fake wound that shoot blood and will attach it under my pants so when I start chewing, the blood will start spewing! Happy Halloween! I’m dressing as a zombie cheerleader….and my date is a zombie football player. Thanks for the makeup ideas!! I am an amputee so i figured that a Zombie Costume would be perfect. I lost my right leg below the knee in a motorcycle accident last year. So I am going to dress up like a zombie and carry a fake leg to chew on. Me and a bunch of my friends are gonna go like this. A couple of us will be survivors and the rest zombies. And the zombie’s costumes for women? 365 Halloween Response: This tutorial is 100% unisex, Mely! Use ANY outfit: you are not limited to using a suit as our zombie happens to be wearing. The makeup is the same for both genders, too. If you’re looking for an exact idea to replicate for a female zombie, try the links we provided above for “zombie cheerleader” or “zombie housewife”… or get creative and make up a female zombie character of your own. The shredding idea for the clothes is good. It makes it a lot more realistic. Time to get dressed for the impending zombie takeover! The 365 Halloween blog has the basics on putting together an authentic zombie costume, along with yummy extras, like creepy skin flaps (pictured), oozing wounds, exposed brain and ground-up neck…..